Few people will admit this kind of morbidity in polite company, but it’s fun to fantasize about having a crazy, over-the-top, orangutans-as-pallbearers, Liza Minnelli-hired-to-wail-as-they-lower-your-coffin-into-the-earth-forever funeral (comedian Nick Swardson, for instance, discusses funeral antics with all the glee of a wedding planner). Though few of us will really have the resources, friends, and gumption to follow through with our dreams of a giant pyre made of money, José Julio Sarria, the first openly gay man to run for office in San Francisco, left behind some pretty elaborate instructions for his own recent funeral, something mourners might have seen coming from someone who earned the title Empress José I in his lifetime. 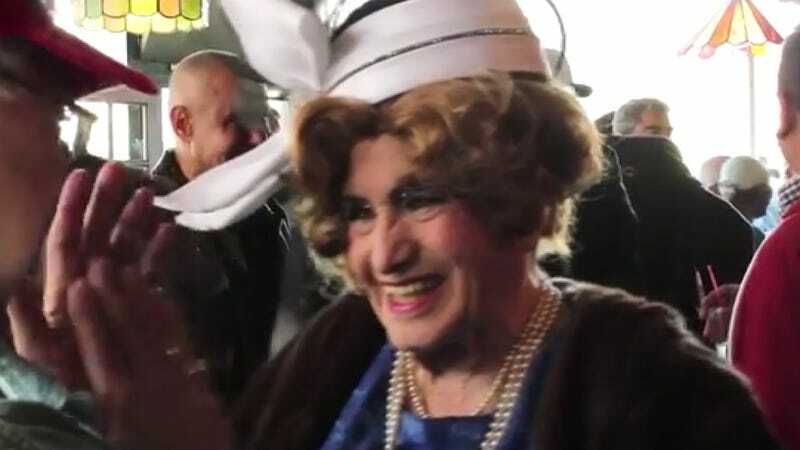 Sarria, a hugely important figure in the gay rights movement, died of cancer last month at the age of 90. On Friday, mourners at San Francisco’s Grace Cathedral participated in a funeral that had been meticulously planned by Sarria, right down to the sartorial details. Female titleholders from his Imperial Court — the gay organization and charity he started in 1965 — are requested to wear "black/dark full length (understated) mourning attire, crowns, shoulder length veils covering both crowns and one’s face" along with "black gloves (opera length if wearing short sleeves)." Males titleholders are "respectfully requested to wear dark suits, crowns and white gloves." Following the Grace Cathedral service, no fewer than 10 limousines and six buses will bring mourners to Colma's Woodlawn Cemetery for "a sensational and inspirational graveside ceremony" where Sarria will be laid to rest with full military honors, a band concert and a song from drag performer Donna Sachet. Sarria, an army vet who has been called the “Rosa Parks” of the gay rights movement, ran unsuccessfully for a seat on the San Francisco Board of Supervisors in 1961. In 1965, he founded the first Imperial Court in San Francisco, an organization that, since spreading across North America, has helped raised millions of dollars for gay causes.